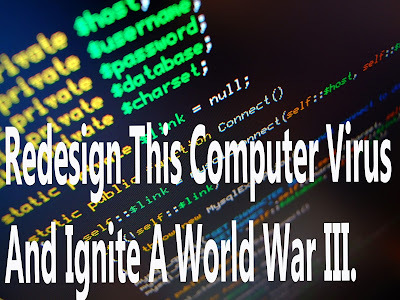 Start a World War 3: Redesign This Computer Virus. Home » War » Start a World War 3: Redesign This Computer Virus. In 2010 a computer virus called STUXNET aka "Cyber Warfare Hiroshima`s" was discovered which is 20 times more powerful than any other malicious software out there. According to a report, it is the most complex virus than those viruses which were detected on most of the data banks of the power plant, Traffic Control System, and factories all around the world. So, now the big question arises that could a computer virus can ignite a World War III? The answer is yes, STUXNET which was responsible for substantial damage to Iran's nuclear program. The software was designed to erase itself in 2012 thus limiting the scope of its effect. The main intention behind making such worm is to destroy Iran's nuclear program. It had the ability to turn off the pressure inside a nuclear reactor and switch off the oil pipelines. Not only that, STUXNET could tell the operators that everything is fine when it was not. This virus had a central mission to shut down the centrifuges that spin the nuclear reactor at Iran`s enrichment facilities. The mastermind behind such a Cyber Weapon. It is believed that this worm was jointly developed by America and Israeli but neither the U.S nor the Israeli confirmed any involvement with STUXNET. It was the first ever created weapon made of Codes. Initially, this worm spread through an infected USB Drive from a Microsoft Windows Operating System. According to Kaspersky Lab research, such malicious software's can use zero day which means undisclosed vulnerabilities of a computer which hacker use to gain access to a PC which is available in DeepWeb for $100,000 and STUXNET used 20 different Zero days. "This attack is counted as one of the great technical blockbusters in malware history". This is not a virus this is actually a Cyber Weapon a key for provoking World War III. Now question arise is not when STUXNET will get active again? but, when STUXNET will be redesigned and get active again? and who will do it? And at the end thanks for reading. Below there`s a video for you to check out. Remember hearing about STUXNET in a youtube video a week ago.